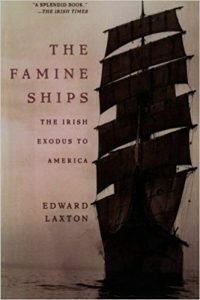 To many starving Irish, the light at the end of the hunger tunnel–and a faint one at that–was a ship to America. Some two million emigrated in a period of a little more than a decade (1845-55). Ireland’s population before the famine was about 8.5 million meaning that nearly a quarter of its population left in those 10 years. Of course the poor cannot afford comfortable space aboard a ship. In fact, these poor literally became ballast. 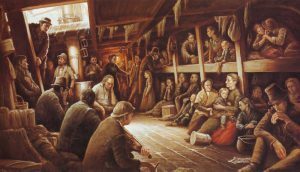 Ships bringing cargo to Europe found that these millions leaving were a source of both revenue and ship stability back across the stormy Atlantic. The ships cargo area simply became human holds where disease spread quickly among those whose health was already poor. 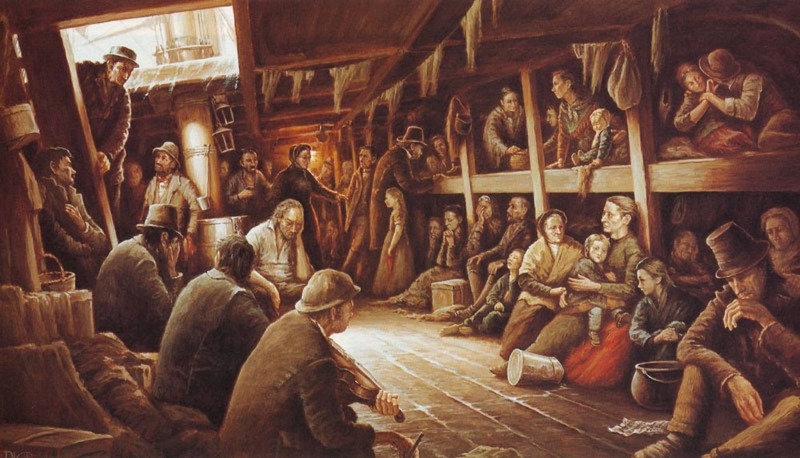 Their choice: to know they would die at home or hope to survive the trans-Atlantic journey. To people who’d never been on a ship, to people who likely could not swim, to people who’d already buried family, to people starving, to people hanging by a thread, the prison of the cargo became a living mass coffin. Until they died. Then the Atlantic became their grave. Buried in the deep. Where hunger cannot find us. The London Celtic Punks review says of the song: A beautiful song with Declan accompanied by harp and pipes on this stunning lament to those poor souls. Emotion spilling out it brought a flush to my cheeks as the realisation of what happened hits home.